For other uses, see Retina (disambiguation). Right human eye cross-sectional view; eyes vary significantly among animals. The neural retina consists of several layers of neurons interconnected by synapses, and is supported by an outer layer of pigmented epithelial cells. The primary light-sensing cells in the retina are the photoreceptor cells, which are of two types: rods and cones. Rods function mainly in dim light and provide black-and-white vision. Cones function in well-lit conditions and are responsible for the perception of colour, as well as high-acuity vision used for tasks such as reading. A third type of light-sensing cell, the photosensitive ganglion cell, is important for entrainment of circadian rhythms and reflexive responses such as the pupillary light reflex. Light striking the retina initiates a cascade of chemical and electrical events that ultimately trigger nerve impulses that are sent to various visual centres of the brain through the fibres of the optic nerve. Neural signals from the rods and cones undergo processing by other neurons, whose output takes the form of action potentials in retinal ganglion cells whose axons form the optic nerve. Several important features of visual perception can be traced to the retinal encoding and processing of light. In vertebrate embryonic development, the retina and the optic nerve originate as outgrowths of the developing brain, specifically the embryonic diencephalon; thus, the retina is considered part of the central nervous system (CNS) and is actually brain tissue. It is the only part of the CNS that can be visualized non-invasively. The vertebrate retina is inverted in the sense that the light sensing cells are in back of the retina, so that light has to pass through layers of neurons and capillaries before it reaches the rods and cones. The ganglion cells, whose axons form the optic nerve, are at the front of the retina; therefore the optic nerve must cross through the retina en route to the brain. In this region there are no photoreceptors, giving rise to the blind spot. In contrast, in the cephalopod retina the photoreceptors are in front, with processing neurons and capillaries behind them. Because of this, cephalopods do not have a blind spot. Although the overlying neural tissue is partly transparent, and the accompanying glial cells have been shown to act as fibre-optic channels to transport photons directly to the photoreceptors, light scattering does occur. Some vertebrates, including humans, have an area of the central retina adapted for high-acuity vision. This area, termed the fovea centralis, is avascular (does not have blood vessels), and has minimal neural tissue in front of the photoreceptors, thereby minimizing light scattering. The cephalopods have a non-inverted retina which is comparable in resolving power to the eyes of many vertebrates. Squid eyes do not have an analog of the vertebrate retinal pigment epithelium (RPE). Although their photoreceptors contain a protein, retinochrome, that recycles retinal and replicates one of the functions of the vertebrate RPE, one could argue that cephalopod photoreceptors are not maintained as well as in vertebrates and that, as a result, the useful lifetime of photoreceptors in invertebrates is much shorter than in vertebrates. Having easily replaced stalk-eyes (some lobsters) or retinae (some spiders, such as Deinopis) rarely occurs. The cephalopod retina does not originate as an outgrowth of the brain, as the vertebrate one does. It is arguable that this difference shows that vertebrate and cephalopod eyes are not homologous but have evolved separately. From an evolutionary perspective, a more complex structure such as the inverted retina can generally come about as a consequence of two alternate processes: (a) an advantageous "good" compromise between competing functional limitations, or (b) as a historical maladaptive relic of the convoluted path of organ evolution and transformation. Vision is an important adaptation in higher vertebrates. A third view of the "inverted" vertebrate eye is that it combines two benefits: the maintenance of the photoreceptors mentioned above, and the reduction in light intensity necessary to avoid blinding the photoreceptors, which are based on the extremely sensitive eyes of the ancestors of modern hagfishes (a fish that lives in very deep, dark water). Inner limiting membrane – basement membrane elaborated by Müller cells. Nerve fibre layer – axons of the ganglion cell nuclei (note that a thin layer of Müller cell footplates exists between this layer and the inner limiting membrane). Ganglion cell layer – contains nuclei of ganglion cells, the axons of which become the optic nerve fibres for messages and some displaced amacrine cells. Inner plexiform layer – contains the synapse between the bipolar cell axons and the dendrites of the ganglion and amacrine cells. Inner nuclear layer – contains the nuclei and surrounding cell bodies (perikarya) of the amacrine cells, bipolar cells, and horizontal cells. Outer plexiform layer – projections of rods and cones ending in the rod spherule and cone pedicle, respectively. These make synapses with dendrites of bipolar cells and horizontal cells. In the macular region, this is known as the Fiber layer of Henle. Outer nuclear layer – cell bodies of rods and cones. External limiting membrane – layer that separates the inner segment portions of the photoreceptors from their cell nuclei. Inner segment / outer segment layer – inner segments and outer segments of rods and cones. The outer segments contain a highly-specialized light-sensing apparatus. Retinal pigment epithelium – single layer of cuboidal epithelial cells (with extrusions not shown in diagram). This layer is closest to the choroid, and provides nourishment and supportive functions to the neural retina. These layers can be grouped into 4 main processing stages: photoreception; transmission to bipolar cells; transmission to ganglion cells, which also contain photoreceptors, the photosensitive ganglion cells; and transmission along the optic nerve. At each synaptic stage there are also laterally connecting horizontal and amacrine cells. The optic nerve is a central tract of many axons of ganglion cells connecting primarily to the lateral geniculate body, a visual relay station in the diencephalon (the rear of the forebrain). It also projects to the superior colliculus, the suprachiasmatic nucleus, and the nucleus of the optic tract. It passes through the other layers, creating the optic disc in primates. Additional structures, not directly associated with vision, are found as outgrowths of the retina in some vertebrate groups. In birds, the pecten is a vascular structure of complex shape that projects from the retina into the vitreous humour; it supplies oxygen and nutrients to the eye, and may also aid in vision. Reptiles have a similar, but much simpler, structure. In section, the retina is no more than 0.5 mm thick. It has three layers of nerve cells and two of synapses, including the unique ribbon synapse. The optic nerve carries the ganglion cell axons to the brain, and the blood vessels that supply the retina. The ganglion cells lie innermost in the eye while the photoreceptive cells lie beyond. Because of this counter-intuitive arrangement, light must first pass through and around the ganglion cells and through the thickness of the retina, (including its capillary vessels, not shown) before reaching the rods and cones. Light is absorbed by the retinal pigment epithelium or the choroid (both of which are opaque). The white blood cells in the capillaries in front of the photoreceptors can be perceived as tiny bright moving dots when looking into blue light. This is known as the blue field entoptic phenomenon (or Scheerer's phenomenon). Between the ganglion cell layer and the rods and cones there are two layers of neuropils where synaptic contacts are made. 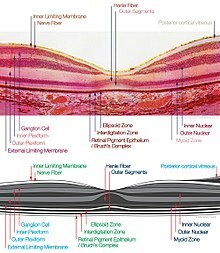 The neuropil layers are the outer plexiform layer and the inner plexiform layer. In the outer neuropil layer, the rods and cones connect to the vertically running bipolar cells, and the horizontally oriented horizontal cells connect to ganglion cells. The central retina predominantly contains cones, while the peripheral retina predominantly contains rods. In total, there are about seven million cones and a hundred million rods. At the centre of the macula is the foveal pit where the cones are narrow and long, and, arranged in a hexagonal mosaic, the most dense. At the foveal pit the other retinal layers are displaced, before building up along the foveal slope until the rim of the fovea, or parafovea, is reached, which is the thickest portion of the retina. The macula has a yellow pigmentation, from screening pigments, and is known as the macula lutea. The area directly surrounding the fovea has the highest density of rods converging on single bipolar cells. Since its cones have a much lesser convergence of signals, the fovea allows for the sharpest vision the eye can attain. Though the rod and cones are a mosaic of sorts, transmission from receptors, to bipolars, to ganglion cells is not direct. Since there are about 150 million receptors and only 1 million optic nerve fibres, there must be convergence and thus mixing of signals. Moreover, the horizontal action of the horizontal and amacrine cells can allow one area of the retina to control another (e.g. one stimulus inhibiting another). This inhibition is key to lessening the sum of messages sent to the higher regions of the brain. In some lower vertebrates (e.g. the pigeon), there is a "centrifugal" control of messages – that is, one layer can control another, or higher regions of the brain can drive the retinal nerve cells, but in primates this does not occur. IS/OS junction or Photoreceptor integrity line (PIL) The photoreceptor connecting cilia which bridge the inner and outer segments of the photoreceptor cells. 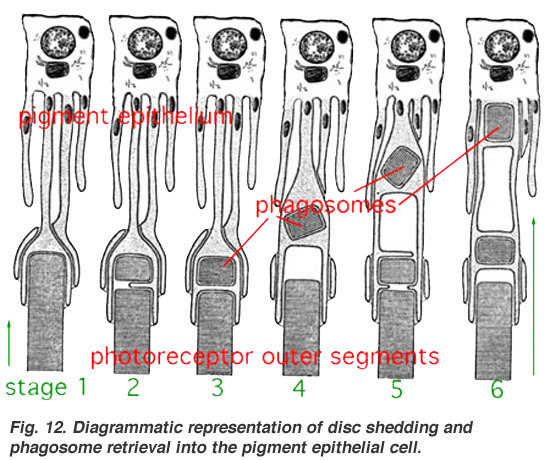 13 Interdigitation zone (IZ) Apices of the RPE cells which encase part of the cone OSs. Retinal development begins with the establishment of the eye fields mediated by the SHH and SIX3 proteins, with subsequent development of the optic vesicles regulated by the PAX6 and LHX2 proteins. The role of Pax6 in eye development was elegantly demonstrated by Walter Gehring and colleagues, who showed that ectopic expression of Pax6 can lead to eye formation on Drosophila antennae, wings, and legs. The optic vesicle gives rise to three structures: the neural retina, the retinal pigmented epithelium, and the optic stalk. The neural retina contains the retinal progenitor cells (RPCs) that give rise to the seven cell types of the retina. Differentiation begins with the retinal ganglion cells and concludes with production of the Muller glia. Although each cell type differentiates from the RPCs in a sequential order, there is considerable overlap in the timing of when individual cell types differentiate. The cues that determine a RPC daughter cell fate are coded by multiple transcription factor families including the bHLH and homeodomain factors. In addition to guiding cell fate determination, cues exist in the retina to determine the dorsal-ventral (D-V) and nasal-temporal (N-T) axes. The D-V axis is established by a ventral to dorsal gradient of VAX2, whereas the N-T axis is coordinated by expression of the forkhead transcription factors FOXD1 and FOXG1. Additional gradients are formed within the retina that aid in proper targeting of RGC axons that function to establish the retinotopic map. Fundus photograph showing the blood vessels in a normal human retina. Veins are darker and slightly wider than corresponding arteries. The optic disc is at right, and the macula lutea is near the centre. The retina is stratified into distinct layers, each containing specific cell types or cellular compartments that have metabolisms with different nutritional requirements. To satisfy these requirements, the ophthalmic artery bifurcates and supplies the retina via two distinct vascular networks: the choroidal network, which supplies the choroid and the outer retina, and the retinal network, which supplies the retina's inner layer. At first glance, one may think that the vertebrate retina is "wired wrongly" or "badly designed"; but in fact, the retina could not function if it were not inverted. The photoreceptor layer must be embedded in the retinal pigment epithelium (RPE), which performs at least seven vital functions, one of the most obvious being to supply oxygen and other necessary nutrients needed for the photoreceptors to function. These nutrients include glucose, fatty acids, and retinal. The mammalian photoreceptor amplification process uses large quantities energy for vision in photopic conditions (requiring less under scotopic conditions) and, thus, requires the large supply nutrients supplied by the blood vessels in the choroid, which lies beyond the RPE. The choroid supplies about 75% of these nutrients to the retina and the retinal vasculature only 25%. When light strikes 11-cis-retinal (in the disks in the rods and cones), 11-cis-retinal changes to all-trans-retinal which then triggers changes in the opsins. Now, the outer segments do not regenerate the retinal back into the cis- form once it has been changed by light. Instead the retinal is pumped out to the surrounding RPE where it is regenerated and transported back into the outer segments of the photoreceptors. This recycling function of the RPE protects the photoreceptors against photo-oxidative damage and allows the photoreceptor cells to have decades-long useful lives. The bird retina is devoid of blood vessels, perhaps to give unobscured passage of light for forming images, thus giving better resolution. It is, therefore, a considered view that the bird retina depends for nutrition and oxygen supply on a specialized organ, called the "pecten" or pecten oculi, located on the blind spot or optic disk. This organ is extremely rich in blood vessels and is thought to supply nutrition and oxygen to the bird retina by diffusion through the vitreous body. The pecten is highly rich in alkaline phosphatase activity and polarized cells in its bridge portion – both befitting its secretory role. Pecten cells are packed with dark melanin granules, which have been theorized to keep this organ warm with the absorption of stray light falling on the pecten. This is considered to enhance metabolic rate of the pecten, thereby exporting more nutritive molecules to meet the stringent energy requirements of the retina during long periods of exposure to light. The bifurcations and other physical characteristics of the inner retinal vascular network are known to vary among individuals, and these individual variances have been used for biometric identification and for early detection of the onset of disease. The mapping of vascular bifurcations is one of the basic steps in biometric identification. Results of such analyses of retinal blood vessel structure can be evaluated against the ground truth data of vascular bifurcations of retinal fundus images that are obtained from the DRIVE dataset. In addition, the classes of vessels of the DRIVE dataset have also been identified, and an automated method for accurate extraction of these bifurcations is also available. Changes in retinal blood circulation are seen with aging and exposure to air pollution, and may indicate cardiovascular diseases such as hypertension and atherosclerosis. Determining the equivalent width of arterioles and venules near the optic disc is also a widely used technique to identify cardiovascular risks. The retina translates an optical image into neural impulses by the patterned excitation of the colour-sensitive pigments of its rods and cones, the retina's photoreceptor cells. The excitation is processed by the neural system and various parts of the brain working in parallel to form a representation of the external environment in the brain. The cones respond to bright light and mediate high-resolution colour vision during daylight illumination (also called photopic vision). The rods are saturated at daylight levels and don't contribute to pattern vision. However, rods do respond to dim light and mediate lower-resolution, monochromatic vision under very low levels of illumination (called scotopic vision). The illumination in most office settings falls between these two levels and is called mesopic vision. At mesopic light levels, both the rods and cones are actively contributing pattern information. What contribution the rod information makes to pattern vision under these circumstances is unclear. The response of cones to various wavelengths of light is called their spectral sensitivity. In normal human vision, the spectral sensitivity of a cone falls into one of three subtypes, often called blue, green, or red but more accurately known as short, medium, or long wavelength-sensitive cone subtypes. It is a lack of one or more of the cone subtypes that causes individuals to have deficiencies in colour vision or various kinds of colour blindness. These individuals are not blind to objects of a particular colour but are unable to distinguish between colours that can be distinguished by people with normal vision. Humans have this trichromatic vision, while most other mammals lack cones with red sensitive pigment and therefore have poorer dichromatic colour vision. However, some animals have four spectral subtypes, e.g. the trout adds an ultraviolet subgroup to short, medium, and long subtypes that are similar to humans. Some fish are sensitive to the polarization of light as well. In the photoreceptors, exposure to light hyperpolarizes the membrane in a series of graded shifts. The outer cell segment contains a photopigment. Inside the cell the normal levels of cyclic guanosine monophosphate (cGMP) keep the Na+ channel open, and thus in the resting state the cell is depolarised. The photon causes the retinal bound to the receptor protein to isomerise to trans-retinal. This causes the receptor to activate multiple G-proteins. This in turn causes the Ga-subunit of the protein to activate a phosphodiesterase (PDE6), which degrades cGMP, resulting in the closing of Na+ cyclic nucleotide-gated ion channels (CNGs). Thus the cell is hyperpolarised. The amount of neurotransmitter released is reduced in bright light and increases as light levels fall. The actual photopigment is bleached away in bright light and only replaced as a chemical process, so in a transition from bright light to darkness the eye can take up to thirty minutes to reach full sensitivity. When thus excited by light, the photoceptor sends a proportional response synaptically to bipolar cells which in turn signal the retinal ganglion cells. The photoreceptors are also cross-linked by horizontal cells and amacrine cells, which modify the synaptic signal before it reaches the ganglion cells, the neural signals being intermixed and combined. Of the retina's nerve cells, only the retinal ganglion cells and few amacrine cells create action potentials. In the retinal ganglion cells there are two types of response, depending on the receptive field of the cell. 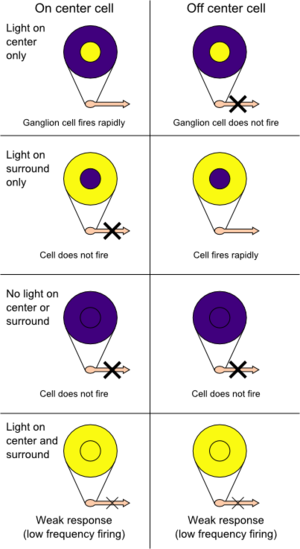 The receptive fields of retinal ganglion cells comprise a central, approximately circular area, where light has one effect on the firing of the cell, and an annular surround, where light has the opposite effect. In ON cells, an increment in light intensity in the centre of the receptive field causes the firing rate to increase. In OFF cells, it makes it decrease. In a linear model, this response profile is well described by a difference of Gaussians and is the basis for edge detection algorithms. Beyond this simple difference, ganglion cells are also differentiated by chromatic sensitivity and the type of spatial summation. Cells showing linear spatial summation are termed X cells (also called parvocellular, P, or midget ganglion cells), and those showing non-linear summation are Y cells (also called magnocellular, M, or parasol retinal ganglion cells), although the correspondence between X and Y cells (in the cat retina) and P and M cells (in the primate retina) is not as simple as it once seemed. In the transfer of visual signals to the brain, the visual pathway, the retina is vertically divided in two, a temporal (nearer to the temple) half and a nasal (nearer to the nose) half. The axons from the nasal half cross the brain at the optic chiasma to join with axons from the temporal half of the other eye before passing into the lateral geniculate body. Although there are more than 130 million retinal receptors, there are only approximately 1.2 million fibres (axons) in the optic nerve. So, a large amount of pre-processing is performed within the retina. The fovea produces the most accurate information. Despite occupying about 0.01% of the visual field (less than 2° of visual angle), about 10% of axons in the optic nerve are devoted to the fovea. 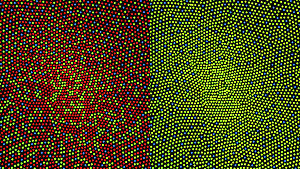 The resolution limit of the fovea has been determined to be around 10,000 points. The information capacity is estimated at 500,000 bits per second (for more information on bits, see information theory) without colour or around 600,000 bits per second including colour. When the retina sends neural impulses representing an image to the brain, it spatially encodes (compresses) those impulses to fit the limited capacity of the optic nerve. Compression is necessary because there are 100 times more photoreceptor cells than ganglion cells. This is done by "decorrelation", which is carried out by the "centre–surround structures", which are implemented by the bipolar and ganglion cells. There are two types of centre–surround structures in the retina – on-centres and off-centres. On-centres have a positively weighted centre and a negatively weighted surround. Off-centres are just the opposite. Positive weighting is more commonly known as excitatory, and negative weighting as inhibitory. These centre–surround structures are not physical apparent, in the sense that one cannot see them by staining samples of tissue and examining the retina's anatomy. The centre–surround structures are logical (i.e., mathematically abstract) in the sense that they depend on the connection strengths between bipolar and ganglion cells. It is believed that the connection strengths between cells is caused by the number and types of ion channels embedded in the synapses between the bipolar and ganglion cells. The centre–surround structures are mathematically equivalent to the edge detection algorithms used by computer programmers to extract or enhance the edges in a digital photograph. Thus, the retina performs operations on the image-representing impulses to enhance the edges of objects within its visual field. For example, in a picture of a dog, a cat and a car, it is the edges of these objects that contain the most information. In order for higher functions in the brain (or in a computer for that matter) to extract and classify objects such as a dog and a cat, the retina is the first step to separating out the various objects within the scene. As an example, the following matrix is at the heart of a computer algorithm that implements edge detection. This matrix is the computer equivalent to the centre–surround structure. In this example, each box (element) within this matrix would be connected to one photoreceptor. The photoreceptor in the centre is the current receptor being processed. The centre photoreceptor is multiplied by the +1 weight factor. The surrounding photoreceptors are the "nearest neighbors" to the centre and are multiplied by the -1/8 value. The sum of all nine of these elements is finally calculated. This summation is repeated for every photoreceptor in the image by shifting left to the end of a row and then down to the next line. The total sum of this matrix is zero, if all the inputs from the nine photoreceptors are of the same value. The zero result indicates the image was uniform (non-changing) within this small patch. Negative or positive sums mean the image was varying (changing) within this small patch of nine photoreceptors. The table is square while the centre–surround structures in the retina are circular. The retina performs all these calculations in parallel while the computer operates on each pixel one at a time. The retina performs no repeated summations and shifting as would a computer. Finally, the horizontal and amacrine cells play a significant role in this process, but that is not represented here. Once the image is spatially encoded by the centre–surround structures, the signal is sent out along the optic nerve (via the axons of the ganglion cells) through the optic chiasm to the LGN (lateral geniculate nucleus). The exact function of the LGN is unknown at this time. The output of the LGN is then sent to the back of the brain. Specifically, the output of the LGN "radiates" out to the V1 primary visual cortex. Retinitis pigmentosa is a group of genetic diseases that affect the retina and cause the loss of night vision and peripheral vision. Macular degeneration describes a group of diseases characterized by loss of central vision because of death or impairment of the cells in the macula. Cone-rod dystrophy (CORD) describes a number of diseases where vision loss is caused by deterioration of the cones and/or rods in the retina. In retinal separation, the retina detaches from the back of the eyeball. Ignipuncture is an outdated treatment method. The term retinal detachment is used to describe a separation of the neurosensory retina from the retinal pigment epithelium. There are several modern treatment methods for fixing a retinal detachment: pneumatic retinopexy, scleral buckle, cryotherapy, laser photocoagulation and pars plana vitrectomy. Retinoblastoma is a cancer of the retina. Retinal diseases in dogs include retinal dysplasia, progressive retinal atrophy, and sudden acquired retinal degeneration. Lipemia retinalis is a white appearance of the retina, and can occur by lipid deposition in lipoprotein lipase deficiency. A number of different instruments are available for the diagnosis of diseases and disorders affecting the retina. Ophthalmoscopy and fundus photography have long been used to examine the retina. Recently, adaptive optics has been used to image individual rods and cones in the living human retina, and a company based in Scotland has engineered technology that allows physicians to observe the complete retina without any discomfort to patients. The electroretinogram is used to non-invasively measure the retina's electrical activity, which is affected by certain diseases. A relatively new technology, now becoming widely available, is optical coherence tomography (OCT). This non-invasive technique allows one to obtain a 3D volumetric or high resolution cross-sectional tomogram of the fine structures of the retina, with histologic quality. Treatment depends upon the nature of the disease or disorder. Gene therapy holds promise as a potential avenue to cure a wide range of retinal diseases. This involves using a non-infectious virus to shuttle a gene into a part of the retina. Recombinant adeno-associated virus (rAAV) vectors possess a number of features that render them ideally suited for retinal gene therapy, including a lack of pathogenicity, minimal immunogenicity, and the ability to transduce postmitotic cells in a stable and efficient manner. rAAV vectors are increasingly utilized for their ability to mediate efficient transduction of retinal pigment epithelium (RPE), photoreceptor cells and retinal ganglion cells. Each cell type can be specifically targeted by choosing the appropriate combination of AAV serotype, promoter, and intraocular injection site. Several clinical trials have already reported positive results using rAAV to treat Leber's congenital amaurosis, showing that the therapy was both safe and effective. There were no serious adverse events, and patients in all three studies showed improvement in their visual function as measured by a number of methods. The methods used varied among the three trials, but included both functional methods such as visual acuity and functional mobility as well as objective measures that are less susceptible to bias, such as the pupil's ability to respond to light and improvements on functional MRI. Improvements were sustained over the long-term, with patients continuing to do well after more than 1.5 years. The unique architecture of the retina and its relatively immune-privileged environment help this process. Tight junctions that form the blood retinal barrier separate the subretinal space from the blood supply, thus protecting it from microbes and most immune-mediated damage, and enhancing its potential to respond to vector-mediated therapies. The highly compartmentalized anatomy of the eye facilitates accurate delivery of therapeutic vector suspensions to specific tissues under direct visualization using microsurgical techniques. In the sheltered environment of the retina, AAV vectors are able to maintain high levels of transgene expression in the retinal pigmented epithelium (RPE), photoreceptors, or ganglion cells for long periods of time after a single treatment. In addition, the eye and the visual system can be routinely and easily monitored for visual function and retinal structural changes after injections with noninvasive advanced technology, such as visual acuities, contrast sensitivity, fundus auto-fluorescence (FAF), dark-adapted visual thresholds, vascular diameters, pupillometry, electroretinography (ERG), multifocal ERG and optical coherence tomography (OCT). This strategy is effective against a number of retinal diseases that have been studied, including neovascular diseases that are features of age-related macular degeneration, diabetic retinopathy and retinopathy of prematurity. Since the regulation of vascularization in the mature retina involves a balance between endogenous positive growth factors, such as vascular endothelial growth factor (VEGF) and inhibitors of angiogenesis, such as pigment epithelium-derived factor (PEDF), rAAV-mediated expression of PEDF, angiostatin, and the soluble VEGF receptor sFlt-1, which are all antiangiogenic proteins, have been shown to reduce aberrant vessel formation in animal models. Since specific gene therapies cannot readily be used to treat a significant fraction of patients with retinal dystrophy, there is a major interest in developing a more generally applicable survival factor therapy. Neurotrophic factors have the ability to modulate neuronal growth during development to maintain existing cells and to allow recovery of injured neuronal populations in the eye. AAV encoding neurotrophic factors such as fibroblast growth factor (FGF) family members and GDNF either protected photoreceptors from apoptosis or slowed down cell death. Organ transplantation Transplantation of retinas has been attempted, but without much success. At MIT, The University of Southern California, RWTH Aachen University, and the University of New South Wales, an "artificial retina" is under development: an implant which will bypass the photoreceptors of the retina and stimulate the attached nerve cells directly, with signals from a digital camera. In 1894, Santiago Ramón y Cajal published the first major characterization of retinal neurons in Retina der Wirbelthiere (The Retina of Vertebrates). George Wald, Haldan Keffer Hartline, and Ragnar Granit won the 1967 Nobel Prize in Physiology or Medicine for their scientific research on the retina. A recent University of Pennsylvania study calculated that the approximate bandwidth of human retinas is 8.75 megabits per second, whereas a guinea pig's retinal transfer rate is 875 kilobits per second. MacLaren & Pearson and colleagues at University College London and Moorfields Eye Hospital in London, in 2006, showed that photoreceptor cells could be transplanted successfully in the mouse retina if donor cells were at a critical developmental stage. Recently Ader and colleagues in Dublin showed, using the electron microscope, that transplanted photoreceptors formed synaptic connections. In 2012, Sebastian Seung and his laboratory at MIT launched EyeWire, an online Citizen science game where players trace neurons in the retina. The goals of the EyeWire project are to identify specific cell types within the known broad classes of retinal cells, and to map the connections between neurons in the retina, which will help to determine how vision works. Illustration of image as 'seen' by the retina independent of optic nerve and striate cortex processing. ^ J, Krause William (1 July 2005). Krause's Essential Human Histology for Medical Students. Boca Raton: Universal Publishers. ISBN 978-1-58112-468-2. ^ a b Kolb, Helga. "Simple Anatomy of the Retina". Webvision. Retrieved 1 January 2018. ^ Kolb, Helga. "Photoreceptors". Webvision. Retrieved 11 January 2018. ^ Franze K, Grosche J, Skatchkov SN, Schinkinger S, Foja C, Schild D, Uckermann O, Travis K, Reichenbach A, Guck J (2007). "Muller cells are living optical fibers in the vertebrate retina". Proc. Natl. Acad. Sci. U.S.A. 104 (20): 8287–92. Bibcode:2007PNAS..104.8287F. doi:10.1073/pnas.0611180104. PMC 1895942. PMID 17485670. ^ Baker, Oliver (23 April 2010). "Focus: Eye Cells as Light Pipes". Phys. Rev. Focus. 25 (15). doi:10.1103/physrevfocus.25.15. ^ a b Bringmann A, Syrbe S, Görner K, Kacza J, Francke M, Wiedemann P, Reichenbach A (2018). "The primate fovea: Structure, function and development". Prog Retin Eye Res. 66: 49–84. doi:10.1016/j.preteyeres.2018.03.006. PMID 29609042. ^ Sperling, L.; Hubbard, R. (1 February 1975). "Squid retinochrome". The Journal of General Physiology. 65 (2): 235–251. doi:10.1085/jgp.65.2.235. ISSN 0022-1295. PMC 2214869. PMID 235007. ^ "How spiders see the world – Australian Museum". www.australianmuseum.net.au. Archived from the original on 12 September 2017. Retrieved 5 December 2017. ^ Drazen, J. C.; Yeh, J.; Friedman, J.; Condon, N. (June 2011). "Metabolism and enzyme activities of hagfish from shallow and deep water of the Pacific Ocean". Comparative Biochemistry and Physiology Part A: Molecular & Integrative Physiology. 159 (2): 182–187. doi:10.1016/j.cbpa.2011.02.018. PMID 21356325. ^ Goldberg AF, Moritz OL, Williams DS (2016). "Molecular basis for photoreceptor outer segment architecture". Prog Retin Eye Res. 55: 52–81. doi:10.1016/j.preteyeres.2016.05.003. PMC 5112118. PMID 27260426. ^ Arshavsky VY, Burns ME (2012). "Photoreceptor signaling: supporting vision across a wide range of light intensities". J Biol Chem. 287 (3): 1620–6. doi:10.1074/jbc.R111.305243. PMC 3265842. PMID 22074925. ^ Sparrow JR, Hicks D, Hamel CP (2010). "The retinal pigment epithelium in health and disease". Curr Mol Med. 10 (9): 802–23. doi:10.2174/156652410793937813. PMC 4120883. PMID 21091424. ^ Letelier J, Bovolenta P, Martínez-Morales JR (2017). "The pigmented epithelium, a bright partner against photoreceptor degeneration". J Neurogenet. 31 (4): 203–215. doi:10.1080/01677063.2017.1395876. PMID 29113536. ^ Shepherd, Gordon (2004). The Synaptic Organization of the Brain. New York, NY: Oxford University Press. pp. 217–225. ISBN 978-0-19-515956-1. ^ Romer, Alfred Sherwood; Parsons, Thomas S. (1977). The Vertebrate Body. Philadelphia, PA: Holt-Saunders International. p. 465. ISBN 978-0-03-910284-5. ^ a b c Cuenca, Nicolás; Ortuño-Lizarán, Isabel; Pinilla, Isabel (March 2018). "Cellular Characterization of OCT and Outer Retinal Bands Using Specific Immunohistochemistry Markers and Clinical Implications". Ophthalmology. 125 (3): 407–422. doi:10.1016/j.ophtha.2017.09.016. hdl:10045/74474. PMID 29037595. ^ a b c d e f g h i j k l m n o p q Staurenghi, Giovanni; Sadda, Srinivas; Chakravarthy, Usha; Spaide, Richard F. (2014). "Proposed Lexicon for Anatomic Landmarks in Normal Posterior Segment Spectral-Domain Optical Coherence Tomography". Ophthalmology. 121 (8): 1572–1578. doi:10.1016/j.ophtha.2014.02.023. PMID 24755005. ^ a b Hildebrand, Göran Darius; Fielder, Alistair R. (2011). Pediatric Retina. Springer, Berlin, Heidelberg. pp. 39–65. doi:10.1007/978-3-642-12041-1_2. ISBN 9783642120404. ^ Turgut, Burak; University, Fırat; Medicine, School of; Ophthalmology, Department of; Elazig; Turkey (2017). "Past and Present Terminology for the Retinal and Choroidal Structures in Optical Coherence Tomography". European Ophthalmic Review. 11 (1): 59. doi:10.17925/eor.2017.11.01.59. ^ Boston, Marco A. Bonini Filho, MD, and Andre J. Witkin, MD,. "Outer Retinal Layers as Predictors of Vision Loss". Retrieved 7 April 2018. ^ a b c Heavner, W; Pevny, L (1 December 2012). "Eye development and retinogenesis". Cold Spring Harbor Perspectives in Biology. 4 (12): a008391. doi:10.1101/cshperspect.a008391. PMC 3504437. PMID 23071378. ^ Halder, G; Callaerts, P; Gehring, WJ (24 March 1995). "Induction of ectopic eyes by targeted expression of the eyeless gene in Drosophila". Science. 267 (5205): 1788–92. Bibcode:1995Sci...267.1788H. doi:10.1126/science.7892602. PMID 7892602. ^ Hatakeyama, J; Kageyama, R (February 2004). "Retinal cell fate determination and bHLH factors". Seminars in Cell & Developmental Biology. 15 (1): 83–9. doi:10.1016/j.semcdb.2003.09.005. PMID 15036211. ^ Ann., Remington, Lee (2012). Clinical anatomy and physiology of the visual system (3rd ed.). St. Louis: Elsevier/Butterworth-Heinemann. ISBN 978-1-4377-1926-0. OCLC 745905738. ^ Yu, DY; Yu, PK; Cringle, SJ; Kang, MH; Su, EN (May 2014). "Functional and morphological characteristics of the retinal and choroidal vasculature". Progress in Retinal and Eye Research. 40: 53–93. doi:10.1016/j.preteyeres.2014.02.001. PMID 24583621. ^ Kiel, Jeffrey W. Anatomy. Morgan & Claypool Life Sciences. Archived from the original on 5 December 2017. Retrieved 17 April 2017. ^ Strauss, Olaf. "The retinal pigment epithelium". Webvision. Retrieved 1 January 2018. ^ Photobiology of the retina "LIGHT-INDUCED DAMAGE to the RETINA". Archived from the original on 9 August 2012. Retrieved 27 July 2012. ^ Bawa S.R. ; YashRoy R.C. (1972). "Effect of dark and light adaptation on the retina and pecten of chicken". Experimental Eye Research. 13: 92–97. doi:10.1016/0014-4835(72)90129-7. Archived from the original on 9 October 2014. ^ Bawa, S.R. ; YashRoy, R.C. (1974). "Structure and function of vulture pecten". Cells Tissues Organs. 89 (3): 473–480. doi:10.1159/000144308. Archived from the original on 14 July 2015. ^ Sherman, T (1981). "On connecting large vessels to small – the meaning of murray law". Journal of General Physiology. 78 (4): 431–453. doi:10.1085/jgp.78.4.431. PMC 2228620. PMID 7288393. ^ Azzopardi G.; Petkov N. (2011). Detection of retinal vascular bifurcations by trainable V4-like filters, in Computer Analysis of Images and Patterns (CAIP), Seville (PDF). Lecture Notes in Computer Science. 6854. pp. 451–459. doi:10.1007/978-3-642-23672-3_55. ISBN 978-3-642-23671-6. Archived (PDF) from the original on 9 August 2017. ^ "Retinal fundus images – Ground truth of vascular bifurcations and crossovers". University of Groningen. Retrieved 20 April 2018. ^ "DRIVE: Digital Retinal Images for Vessel Extraction". Image Sciences Institute, Utrecht University. Retrieved 20 April 2018. ^ Qureshi, T. A.; Habib, M.; Hunter, A.; Al-Diri, B. (June 2013). A manually-labeled, artery/vein classified benchmark for the DRIVE dataset. Proceedings of the 26th IEEE International Symposium on Computer-Based Medical Systems. pp. 485–488. doi:10.1109/cbms.2013.6627847. ISBN 978-1-4799-1053-3. ^ Qureshi, T. A.; Hunter, A.; Al-Diri, B. (June 2014). A Bayesian Framework for the Local Configuration of Retinal Junctions. 2014 IEEE Conference on Computer Vision and Pattern Recognition. pp. 3105–3110. CiteSeerX 10.1.1.1026.949. doi:10.1109/cvpr.2014.397. ISBN 978-1-4799-5118-5. ^ Adar SD, Klein R, Klein BE, Szpiro AA, Cotch MF, Wong TY, et al. (2010). "Air Pollution and the microvasculature: a crosssectional assessment of in vivo retinal images in the population based multiethnic study of atherosclerosis (MESA)". PLoS Med. 7 (11): e1000372. doi:10.1371/journal.pmed.1000372. PMC 2994677. PMID 21152417. ^ Louwies, Tijs; Panis, Luc Int; Kicinski, Michal; Boever, Patrick De; Nawrot, Tim S. (2013). "Retinal Microvascular Responses to Short-Term Changes in Particulate Air Pollution in Healthy Adults". Environmental Health Perspectives. 121 (9): 1011–6. doi:10.1289/ehp.1205721. PMC 3764070. PMID 23777785. ^ Tso, Mark O.M. ; Jampol, Lee M. (1982). "Pathophysiology of Hypertensive Retinopathy". Ophthalmology. 89 (10): 1132–1145. doi:10.1016/s0161-6420(82)34663-1. ^ Chapman, N.; Dell'omo, G.; Sartini, M. S.; Witt, N.; Hughes, A.; Thom, S.; Pedrinelli, R. (1 August 2002). "Peripheral vascular disease is associated with abnormal arteriolar diameter relationships at bifurcations in the human retina". Clinical Science. 103 (2): 111–116. doi:10.1042/cs1030111. ISSN 0143-5221. PMID 12149100. ^ Patton, N.; Aslam, T.; MacGillivray, T.; Deary, I.; Dhillon, B.; Eikelboom, R.; Yogesan, K.; Constable, I. (2006). "Retinal image analysis: Concepts, applications and potential". Progress in Retinal and Eye Research. 25 (1): 99–127. doi:10.1016/j.preteyeres.2005.07.001. PMID 16154379. ^ Wong TY, Knudtson MD, Klein R, Klein BE, Meuer SM, Hubbard LD (2004). "Computer assisted measurement of retinal vessel diameters in the Beaver Dam Eye Study: methodology, correlation between eyes, and effect of refractive errors". Ophthalmology. 111 (6): 1183–1190. doi:10.1016/j.ophtha.2003.09.039. PMID 15177969. ^ Retina (4th ed.). Philadelphia: Elsevier/Mosby. 2006. pp. 2013–2015. ISBN 978-0-323-02598-0. OCLC 62034580. ^ Dinculescu Astra; Glushakova Lyudmyla; Seok-Hong Min; Hauswirth William W (2005). "Adeno-associated virus-vectored gene therapy for retinal disease". Human Gene Therapy. 16 (6): 649–663. doi:10.1089/hum.2005.16.649. PMID 15960597. ^ a b c Cideciyan A. V.; Hauswirth W. W.; Aleman T. S.; Kaushal S.; Schwartz S. B.; Boye S. L.; Windsor E. A. M.; et al. (2009). "Human RPE65 gene therapy for Leber congenital amaurosis: persistence of early visual improvements and safety at 1 year". Human Gene Therapy. 20 (9): 999–1004. doi:10.1089/hum.2009.086. PMC 2829287. PMID 19583479. ^ a b c Simonelli F.; Maguire A. M.; Testa F.; Pierce E. A.; Mingozzi F.; Bennicelli J. L.; Rossi S.; et al. (2010). "Gene therapy for Leber's congenital amaurosis is safe and effective through 1.5 years after vector administration". Molecular Therapy. 18 (3): 643–650. doi:10.1038/mt.2009.277. PMC 2839440. PMID 19953081. ^ a b Maguire A. M.; Simonelli F.; Pierce E. A.; Pugh E. N.; Mingozzi F.; Bennicelli J.; Banfi S.; et al. (2008). "Safety and efficacy of gene transfer for Leber's congenital amaurosis". The New England Journal of Medicine. 358 (21): 2240–2248. doi:10.1056/NEJMoa0802315. PMC 2829748. PMID 18441370. ^ a b Maguire A. M.; High K. A.; Auricchio A.; Wright J. F.; Pierce E. A.; Testa F.; Mingozzi F.; et al. (2009). "Age-dependent effects of RPE65 gene therapy for Leber's congenital amaurosis: a phase 1 dose-escalation trial". Lancet. 374 (9701): 1597–1605. doi:10.1016/S0140-6736(09)61836-5. PMC 4492302. PMID 19854499. ^ Bainbridge J. W. B.; Smith A. J.; Barker S. S.; Robbie S.; Henderson R.; Balaggan K.; Viswanathan A.; et al. (2008). "Effect of gene therapy on visual function in Leber's congenital amaurosis" (PDF). The New England Journal of Medicine. 358 (21): 2231–2239. CiteSeerX 10.1.1.574.4003. doi:10.1056/NEJMoa0802268. PMID 18441371. Archived (PDF) from the original on 11 August 2017. ^ Hauswirth W. W.; Aleman T. S.; Kaushal S.; Cideciyan A. V.; Schwartz S. B.; Wang L.; Conlon T. J.; et al. (2008). "Treatment of Leber Congenital Amaurosis Due to RPE65Mutations by Ocular Subretinal Injection of Adeno-Associated Virus Gene Vector: Short-Term Results of a Phase I Trial". Human Gene Therapy. 19 (10): 979–990. doi:10.1089/hum.2008.107. PMC 2940541. PMID 18774912. ^ Ashtari M.; Cyckowski L. L.; Monroe J. F.; Marshall K. A.; Chung D. C.; Auricchio A.; Simonelli F.; et al. (2011). "The human visual cortex responds to gene therapy-mediated recovery of retinal function". The Journal of Clinical Investigation. 121 (6): 2160–2168. doi:10.1172/JCI57377. PMC 3104779. PMID 21606598. ^ Bennett J (2003). "Immune response following intraocular delivery of recombinant viral vectors". Gene Therapy. 10 (11): 977–982. doi:10.1038/sj.gt.3302030. PMID 12756418. ^ Curace Enrico M.; Auricchio Alberto (2008). "Versatility of AAV vectors for retinal gene transfer". Vision Research. 48 (3): 353–359. doi:10.1016/j.visres.2007.07.027. PMID 17923143. ^ den Hollander, Anneke I.; Roepman, Ronald; Koenekoop, Robert K.; Cremers, Frans P.M. (2008). "Leber congenital amaurosis: Genes, proteins and disease mechanisms". Progress in Retinal and Eye Research. 27 (4): 391–419. doi:10.1016/j.preteyeres.2008.05.003. PMID 18632300. ^ a b Rolling, F. (2004). "Recombinant AAV-mediated gene transfer to the retina: gene therapy perspectives". Gene Therapy. 11 (S1): S26–S32. doi:10.1038/sj.gt.3302366. ISSN 0969-7128. PMID 15454954. ^ "Santiago Ramón y Cajal – Biographical". www.nobelprize.org. Archived from the original on 6 October 2015. Retrieved 20 October 2015. ^ "Nobelprize.org". nobelprize.org. Archived from the original on 30 June 2017. Retrieved 5 December 2017. ^ "Calculating the speed of sight". newscientist.com. Archived from the original on 31 May 2015. Retrieved 5 December 2017. ^ MacLaren, RE; Pearson, RA; MacNeil, A; et al. (November 2006). "Retinal repair by transplantation of photoreceptor precursors" (PDF). Nature. 444 (7116): 203–7. Bibcode:2006Natur.444..203M. doi:10.1038/nature05161. PMID 17093405. ^ Bartsch, U.; Oriyakhel, W.; Kenna, P. F.; Linke, S.; Richard, G.; Petrowitz, B.; Humphries, P.; Farrar, G. J.; Ader, M. (2008). "Retinal cells integrate into the outer nuclear layer and differentiate into mature photoreceptors after subretinal transplantation into adult mice". Experimental Eye Research. 86 (4): 691–700. doi:10.1016/j.exer.2008.01.018. PMID 18329018. ^ "About: EyeWire". Archived from the original on 13 February 2012. Retrieved 26 March 2012. ^ "Retina << EyeWire". Archived from the original on 24 March 2012. Retrieved 27 March 2012. ^ "EyeWire". Archived from the original on 24 April 2012. Retrieved 27 March 2012. Wandell, Brian A. (1995). Foundations of vision. Sunderland, Mass: Sinauer Associates. ISBN 978-0-87893-853-7. Wässle H, Boycott BB (1991). "Functional architecture of the mammalian retina". Physiol. Rev. 71 (2): 447–480. doi:10.1152/physrev.1991.71.2.447. PMID 2006220. Schulz HL, Goetz T, Kaschkoetoe J, Weber BH (2004). "The Retinome – Defining a reference transcriptome of the adult mammalian retina/retinal pigment epithelium". BMC Genomics (about a transcriptome for eye color). 5 (1): 50. doi:10.1186/1471-2164-5-50. PMC 512282. PMID 15283859. Dowling, John (2007). "Retina". Scholarpedia. 2 (12): 3487. Bibcode:2007SchpJ...2.3487D. doi:10.4249/scholarpedia.3487. Khoshbin-e-Khoshnazar, M.R. (2014). "Quantum Superposition in the Retina:Evidences and Proposals". NeuroQuantology. 12 (1): 97–101. doi:10.14704/nq.2014.12.1.685. Kolb, H., Fernandez, E., & Nelson, R. (2003). Webvision: The neural organization of the vertebrate retina. Salt Lake City, Utah: John Moran Eye Center, University of Utah. Retrieved 22 July 2014.